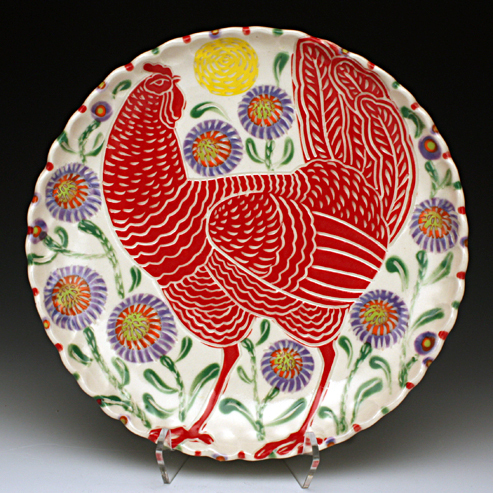 The Red Lodge Clay Center is very pleased to welcome a solo exhibition by Sue Tirrell. Red Lodge native and nationally renowned artist Sue Tirrell describes her artwork as, “folkloric pottery and sculpture with a modern sensibility.” This statement accurately describes the ceramic artworks of Sue Tirrell. She is a contemporary folklorist investigating the legends, stories, and customs included in the traditions of western culture and regional groups. While narrative sculpture is her true passion in clay, functional pottery is her first love and she will always find time to make them. Functional ceramic wares and sculptures provide the canvas for her illustrated narratives, where she carefully carves the animated wild and domestic animals living around her in Paradise Valley, Montana and the surrounding areas. Primarily using porcelain or white stoneware as her preferred clay, Sue’s illustrations become vibrant on top of the white canvas for her utilitarian wares. Unicorns, birds, chickens, and bears are just some of the inhabitants in Sue’s embellished world. Her carefully carved incisions become bold and colorful against the white background, highlighting the chosen animal or figure to become the focal point of the artwork; often at times against a bed of floral designs. Her investigations into the stories and legends of local folklore become transformed into her narratives that sometimes take a closer evaluation to fully understand. One side of a tumbler may have an ornately carved orange chicken, but when viewed at a different angle, shows an axe patiently waiting in a tree stump. A unicorn, with a gold horn, sits on top of a bed of flowers quietly looking across the gallery, gazing at a wolf in sheep’s clothing. Sue’s illustrations are transformed into well-crafted physical manifestations with her sculpture-based artwork.